For my sea-themed potting demo at Roger’s Gardens, I combined rosy-pink barnacles with cuttings of a pink-tipped, cream-striped crassula, and did a multiplant arrangement in a seashell pot. These were something I decided to do on the spur of the moment. Roger’s Gardens (the largest independently owned garden center on the West Coast) is all about opulent, over-the-top displays of succulents and flowering plants. These fill lovely containers, often an urn or pedestal pot that gives the nod to classic East Coast or European design. When I arrived at at 8 a.m., I hit the ground running. Roger’s is a 75-minute drive from my home, and I was scheduled to go on at 9:00. Above: My presentation at Roger’s Gardens, Corona del Mar, CA. I’m under the umbrella at far right. After checking the presentation area, I made a beeline for the indoor retail boutique—an eye-candy cache of home decor enhancements that change kaleidoscopically with the seasons. The shop is full of items of glass, glossy metal, colorful fabrics, and themed stuff…which is what I wanted. I already knew two parts of my design equation—succulents and summer—all I needed was a third. Above: I combined rosy-pink barnacles from the store with cuttings of a pink-tipped, cream-striped crassula. Roger’s sells plenty of decorative pots, and this year large, ceramic-shell planters were new. I decided to fill one with succulents suggestive of undersea flora and fauna. To see how it came together, start to finish, view my YouTube video: Succulents, Shells and Summer: Debra’s Potting Demo at Roger’s Gardens. 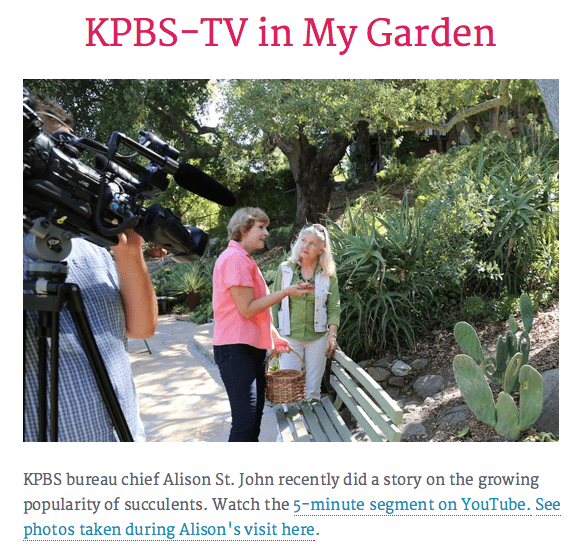 Obtain my comprehensive guide to growing and designing with succulents in containers, Succulent Container Gardens. Watch additional YouTube videos of past presentations at Roger’s Gardens. 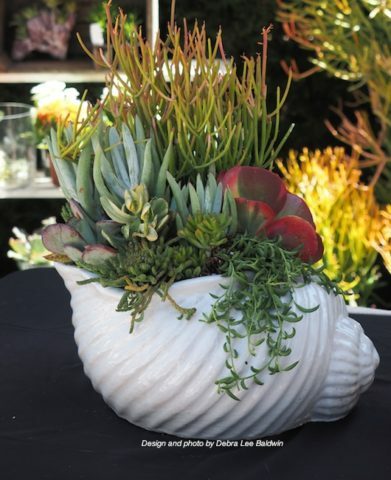 See “Marine Life Look-Alikes” on page 101 of Designing with Succulents (2nd ed).